Can these high-growth cloud service stocks keep outperforming the market? Veeva Systems (NYSE:VEEV) and Salesforce (NYSE:CRM) are both high-growth cloud service companies that bucked the broader market downturn. Veeva's stock has rallied nearly 70% so far this year, while Salesforce has risen nearly 40%. Will both stocks continue to outperform the market next year, or is it time for a breather? What do Veeva and Salesforce do? Salesforce is the largest provider of cloud-based customer relationship management (CRM) services in the world. The company expanded that ecosystem by launching and acquiring new e-commerce and marketing services -- which lock in customers and widen its moat. Salesforce also leverages its new AI platform Einstein to manage customer relationships and help businesses make analytics-driven decisions. Veeva, which was co-founded by former Salesforce executive Peter Gassner, applies a similar business model for the life sciences market. The Veeva Commercial Cloud includes a CRM platform that helps drug companies manage relationships, and the Veeva Vault helps them track industry regulations, clinical trials, and prescribing habits in the cloud. Veeva's CRM platform is powered by the Salesforce1 app development platform, and its services are integrated into Salesforce's Marketing and Service Clouds. Salesforce's main competitors in the cloud CRM market are Oracle (NYSE:ORCL), SAP (NYSE:SAP), Microsoft (NASDAQ:MSFT), and Adobe (NASDAQ:ADBE). Each of these rivals has unique strengths. Oracle and SAP are major players in enterprise software. Microsoft dominates PC operating systems and productivity software, and its Azure cloud platform is growing rapidly. Adobe holds a near-monopoly in cloud-based creativity software. Those companies are leveraging those advantages to expand into the CRM market, but Salesforce still enjoys a first-mover's advantage -- and its "best in breed" reputation continues to attract new customers. Veeva also enjoys a first-mover's advantage in its niche market of cloud services for drug companies. Many major drugmakers -- including GlaxoSmithKline, AstraZeneca, and Novartis -- are already locked into its ecosystem, and the company doesn't face any meaningful competition. 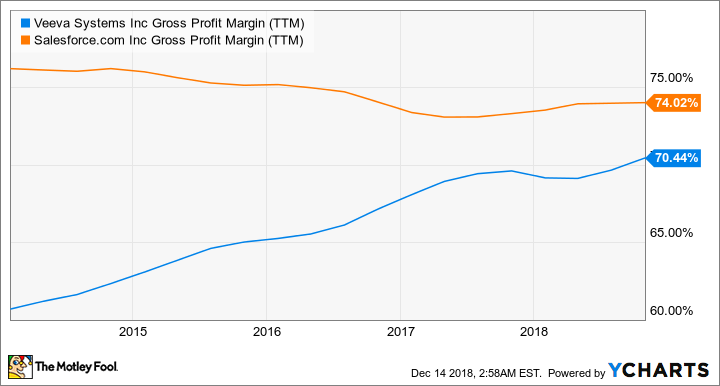 That advantage boosted its gross margin over the past few years as Salesforce's margins slightly dipped. VEEV Gross Profit Margin (TTM) data by YCharts. TTM = trailing 12 months. Veeva continues to expand its ecosystem with new features like Veeva Nitro, a data warehouse for life science companies; the Veeva Vault Training platform, which helps companies train employees; and the Veeva CRM Sunrise UI, which lets employees access the platform across multiple devices. How fast are Veeva and Salesforce growing? Many high-growth cloud service companies tend to generate impressive sales growth with nonexistent GAAP earnings growth, due to competition and the high costs of securing new customers and maintaining a cloud platform. First nine months of fiscal year 2019. Source: quarterly reports. Results in the prior-year period were restated in ASC 606 terms for both companies. YOY = year over year. Analysts expect Veeva's revenue and non-GAAP earnings to rise 25% and 69%, respectively, this year -- followed by 19% sales growth and 13% earnings growth next year. Based on that forecast, Veeva trades at over 50 times forward earnings. Salesforce's revenue and non-GAAP earnings are expected to rise 26% and 93%, respectively, this year -- followed by 21% sales growth and 6% earnings growth next year. Salesforce also trades at just over 50 times forward earnings. Both companies' P/E ratios look similar, but Veeva is pricer on a price-to-sales basis. It currently trades at 16 times this year's sales estimate, versus Salesforce's P/S ratio of 8. Veeva and Salesforce are still both great long-term plays in the cloud services market. However, Veeva faces less competition, has faster-growing margins, and its low enterprise value of $11 billion makes it a lucrative buyout target for bigger industry peers like Salesforce. Therefore, Veeva is the better overall buy at these prices.